I love me some glazed donuts. 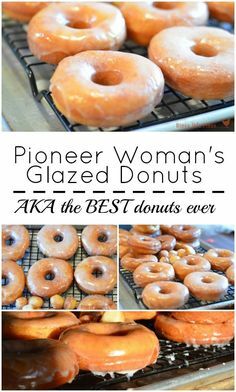 And I especially love Pioneer Woman’s Glazed Donuts recipe. There is no donut-providing bakery anywhere near me. I’m even more than a half hour from a grocery store that sells donuts! It’s a hard life, I know. What do you do when you’re hours away from a donut source? Become the source! Making donuts from scratch is my only option and my, what a delicious option it is. This recipe hails from The Pioneer Woman’s blog and I dare say it is the best homemade glazed donuts recipe ever. These donuts are better than anything you can buy, that I can promise you. The secret is in the dough. You make the dough with a heavy hand of melted butter. The dough is light and sticky, but then you stick that dough in the fridge for a good long while. The butter gets firm again in the fridge and works its magic when you pop these donuts in the hot frying oil. These light donuts almost melt in your mouth when you eat them. 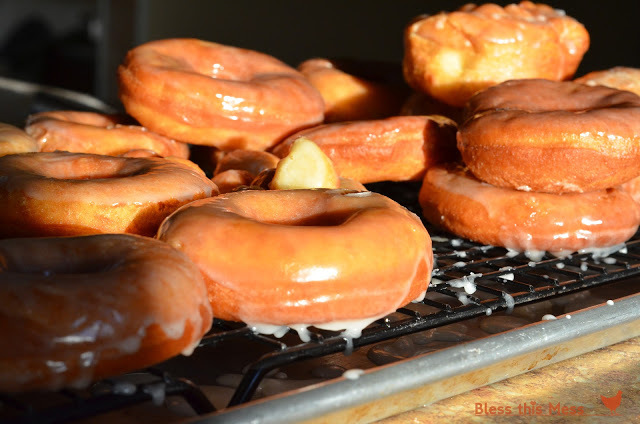 The best homemade yeast glazed donut recipe on the face of the earth. Trust me, I’ve tried them all. To make the dough: warm the milk until it is getting nice and warm when you dip your finger in it (about 105 degrees). Add the milk to a mixing bowl or the bowl of your stand mixer. Add the sugar and stir to dissolve. Add the yeast and stir to combine. Let the yeast rest for 5 minutes. Add the beaten eggs and melted butter to the bowl and stir to combine. While the mixer is running slowly, add the flour and salt and mix until the dough comes together. Mix for a whole five minutes to work the dough well. Turn off the bowl and let the dough sit in the bowl of the mixer for 10 minutes. After the rest period turn the dough out into a lightly oiled bowl, cover the bowl with plastic wrap and refrigerate the dough for at least 8 hours up to overnight. To form the donuts: Remove the dough from the fridge and roll it out on a lightly floured surface until it is 1/2 to 1/3 of an inch thick. Use a three-inch donut cutter to cut out the donuts. Place the cut donuts and holes on a lightly greased baking sheet. Cover the donuts and let them rise until doubled in size, about one hour. The donuts will be very puffy and airy looking. To fry the donuts: Heat a few inches of oil or shortening in a large cast iron skillet or fryer over medium heat until the oil reaches 365 to 375 degrees (use a thermometer!). Carefully add the donuts to the hot oil and fry until golden brown, about 1 1/2 minutes per side. The donut holes will only take about 30 seconds per side. Use a slotted spoon to remove the donuts from the hot oil and place them on a paper towel lined baking sheet to remove extra grease. Let them cool slightly. Dip the hot donuts in the glaze and enjoy right away. For the Glaze: Just combine all the ingredients in a medium bowl and mix until smooth. Add just enough milk to make thin icing. Once the donuts are dipped halfway in the icing take them out, turn them icing side up, and place them on a cooling rack set inside a baking sheet (to catch the drips). This is the most amazing donut recipe and the only one I have made for years. ENJOY! 0 Response to "Pioneer Woman’s Glazed Donuts"